The builders of Monte Alban went to great lengths to build the city on top of an impractical craggy hilltop and in order to provide the open space required for markets, festivals, religious ceremonies and the enormous population, the builders had to flatten the entire hilltop (as you can see from fig: W0069) and dig enclosures and plazas down into the rock rather than building walls around them. This gargantuan effort seems unnecessary, as there was plenty of flat space on the valley floor where building and farming would have been easy, so clearly there was an important motive for building Monte Alban on this hill. The most popular theory is that a threat from rival tribes in the valley prompted the nearby city of San Jose Mogote to relocate to this safe haven. 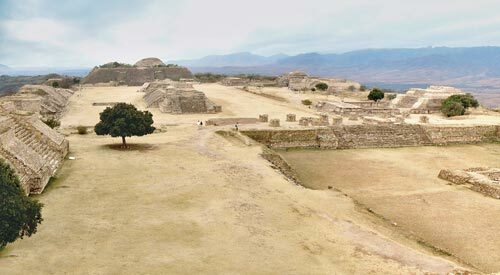 Undoubtedly the location did offer great natural defenses and Monte Alban also held a great strategic position, standing at the centre of the Oaxaca Valley network close to where it splits into three prongs, which meant it could exert its power both militarily and socially on the tribes of the valley. These attributes are certainly what brought about Monte Alban centuries of success as the Zapotec capital, but they weren’t necessarily the reasons why building was originally started here. Fig. W0069: Monte Alban’s Main Plaza Looking North, note the odd shape and misalignment of Building J immediately in front of us. 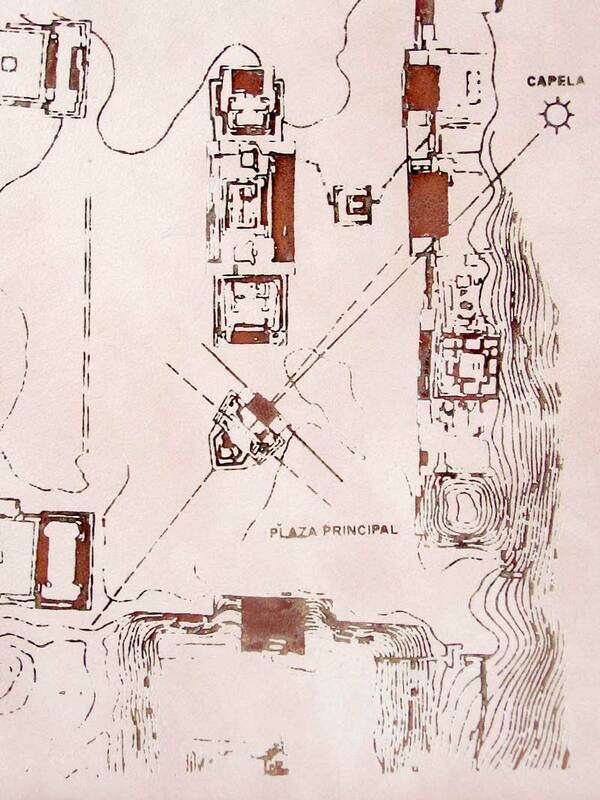 The first clue that Monte Alban is not just a tactical fortress, is the strict north/south alignment. The builders deliberately cut-away the hilltop to create a space that allowed the main plaza and surrounding temples to be aligned from north to south. This additional complexity, and the work involved, proves that it was built this way through necessity – and it certainly wouldn’t have helped the city’s defences, so it must have been built this way for another reason. Typically, cardinal alignments such as this were used to align the temples with the rising and setting sun as well as constellations in order to track time and make offerings to the Gods. 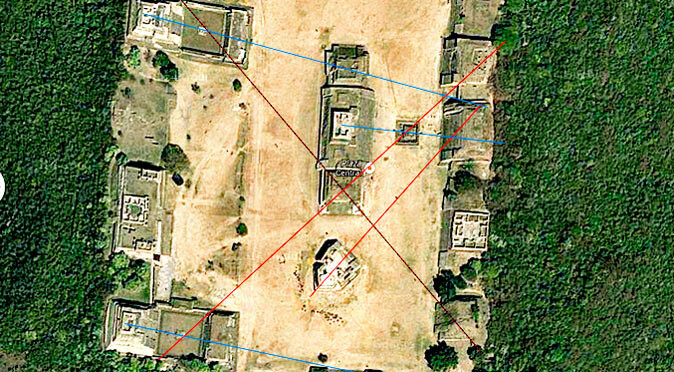 Fig MA01: Map detailing the alignment of Building Jthe three other temples in the central group, the building is skewed awkwardly and points diagonally towards the south west. Not only is its alignment wrong, but it is also a very odd pentagonal shape. Whilst photo W0069 (above) shows the view due north up the main plaza and shows the odd shaped Building J directly in the centre, figure MA01 (left) shows a map of Monte Alban with south at the bottom and north at the top, and as you can see Building J is the only building not following a strict North/South alignment – and features a curious pentagonal shape. This clearly must be deliberate and it has been suggested that Building J may quite literally point to the answer like an arrow. Auriga Constallationconstructed. 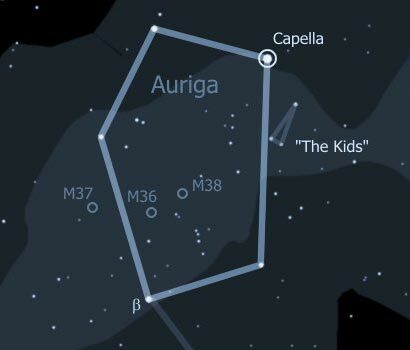 This theory is supported by the shape of Building J, which is the same shape as the five brightest stars of a constellation known to us as Auriga, in which Capella is the brightest star. So it is likely that the whole constellation held significance to the people of Monte Alban, even though it is specifically Capella that Building J was used to observe. The heliacal rising of Capella was incidentally on the same day the sun moved directly overhead as it travelled north and Building J features a “zenith tube” to capture this event. The heliacal rising of a star is the day on which it re-emerges at sunrise after a period of invisibility due to it rising after sunrise (the star then rises earlier each day, i.e. during the night, thus becoming visible again). A zenith tube is a narrow passageway which only allows light to shine directly through it on a specific day when the sun reaches a precise position in the sky . Normally, this would light up a sacred symbol on the floor or an altar where offerings would be left for the Sun God. The combination of the rising of Capella and Auriga in conjunction with the sun moving directly overhead obviously held great meaning to the people of Monte Alban. Quite probably they had attributed the occasion to a mythical event where two Gods, personified as the Sun and Auriga, came together either in a sacred battle or in union. It is certain that a religious festival would have taken place and this maybe detailed in the so called “Conquest Slabs” which adorn Building J. These slabs, which number 40 or so, have been named as conquest slabs in the belief that they represent slain enemies of Monte Alban – presumed to be rival tribal chiefs. Fig. 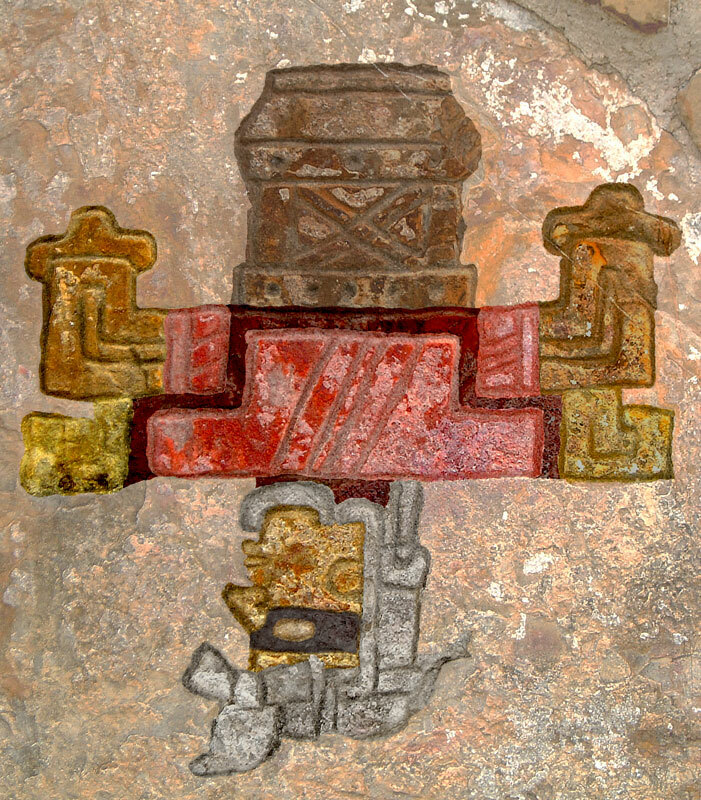 0258c – Colourised Conquest Slab However, they seem to represent human sacrifice rather than conquests (as discussed in the article “Monte Alban – The Conquest Slabs“), which would correlate with a religious festival during which captives or chosen representatives would be sacrificed as part of the ritual. Equally, the astrological event could have signified a favourable portent for going to war, and so successful conquests could also be related to the heliacal rising of Capella and the motion of the Sun overhead. Either way, Building J was certainly used to read celestial events and is deserving of it title, The Observatory. Finally, excavations show that the site had been used for some centuries before the city was built. So, it would seem plausible that the hill was used as an observatory long before the idea of building an impractical city came along. In fact, far from being elected as a the perfect setting for an impenetrable fortress, the city may not have been deliberately built here at all. Instead, the hilltop clearly provided the perfect 360° views of the horizon required to create an observatory capable of reading the omens and portents attributed to astrological alignments and to act as a clock for agriculture and religious festivals. In time, as the plateau was levelled and monuments and temples were erected, a workforce of builders and priests began to occupy the hilltop. The success of its readings may then have made it an important religious sanctuary which attracted pilgrims and royalty from afar- there is even evidence of a Teotihuacan commune here. This in-turn required an ever-expanding workforce and steadily Monte Alban grew from a sacred sanctuary into one of the grandest cities ever built on the American content – to this day. For further information about the astronomical principles used by Monte Alban’s builders, click here. 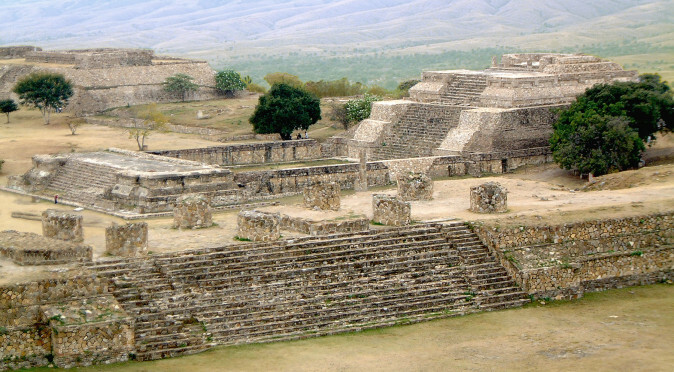 Otherwise, see related articles below to uncover more of Monte Alban history and mstery. Monte Alban - The Conquest Slabs? 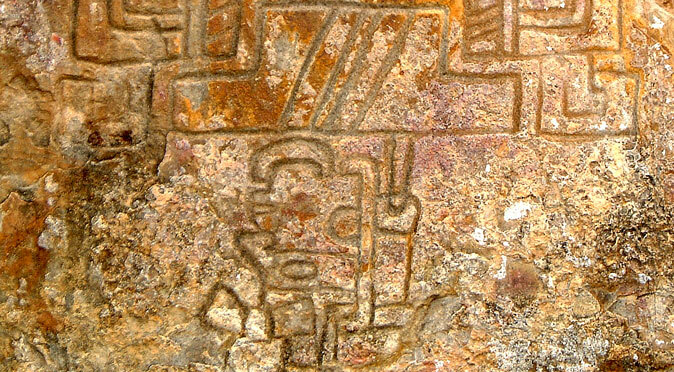 Mounted into the walls of the Observatory are 40 mysterious images known as the "Conquest Slabs". But do they actually record sacrifices rather than conquests? 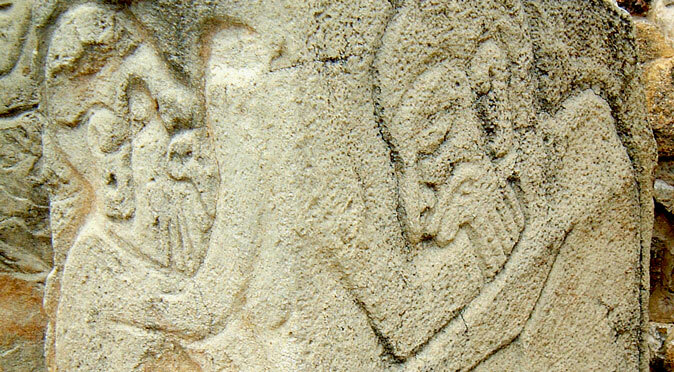 Monte Alban - Are The Danzantes Evidence of an Epidemic?